Do you want to try microservices out but find yourself blocked? Well, Abixen has an open-source platform specifically made for Java-based microservices. Microservices are getting constantly more and more popular. Every month, there are more libraries and solutions supporting a development process, testing, and further support. Many Java developers have heard about the microservices approach, but a significant number of companies have not taken the challenge of implementing a microservices-based architecture. Does this sound familiar? "I know, microservices are awesome, microservices bring easier maintenance and further development, but we have no resources to build a good microservices-based architecture." In this article, let us give a try to go through the architecture of Abixen Platform and explain how this solution helps Java developers to start a microservices adventure. You can also find the platform on GitHub. A lot of developers who have tried to create a microservices-based application (e.g. using the Netflix OSS stack) have wondered if they have sufficient knowledge to configure the whole system. The situation here is very different to monolithic applications, as the extra components come along with desirable functionalities, like request monitoring, a queue for sharing communication between services, a registry service, a configuration service, and many others. It's also common to have a good database, as it's a good practice to keep a separate data model for each microservice. When creating a modularized web application, developers have to be focused on a well-made domain design. 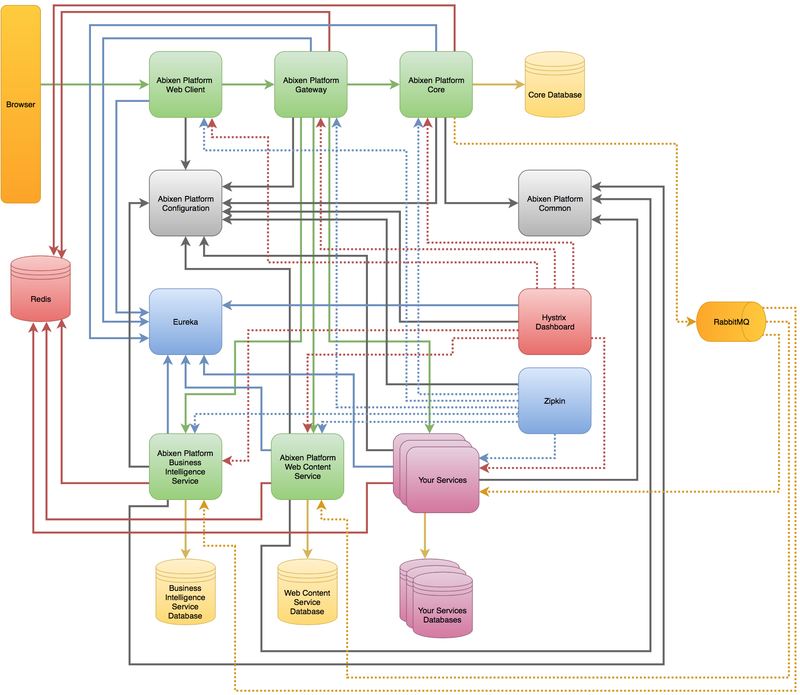 Minimizing all links between modules to a minimum avoids a complex architecture. In the diagram below, you can see the key application elements of the Abixen Platform. Eureka: works as a registry service. Hystrix Dashboard: allows us to monitor request status in real time (e.g. how many requests time out, how many are successful, how many fail, and so on). Zipkin: a distributed tracing system that helps gather timing data needed to troubleshoot latency problems in the application. Redis database: used for keeping information about signed-in users. RabbitMQ: used as a queue for sending messages between particular microservices. For example, in a case when the core microservice must remove a module instance and let the Business Intelligence Service or Web Content Service remove all configurations related to it. Abixen Platform Common: a JAR containing a common API that can be implemented using a new functional microservice. Abixen Platform Configuration: a configuration microservice. Here, an entire application can keep configs for each profile in YAML files. Abixen Platform Web Client: static content of the core functionality, like page and module management, security management, and others. Abixen Platform Gateway: plays the role of a security gateway. Each request must go through this microservice. Abixen Platform Core: has its own core database and holds the core functionalities of the platform, like page and module management, security management, etc. Abixen Platform Business Intelligence Service: Since the application brings functional microservices, here is where we place a module for business intelligence reporting, chart creation, and further management. It also has its own database. Abixen Platform Web Content Service: This is similar to the above service, but this one brings content creation functionalities — e.g. a user is able to create articles. It also has its own database. Your Services: a place designated for custom microservices created by developers using the platform. The architecture is based on the Netflix OSS stack. The functional microservices are not required to properly work through the whole platform. If you want to use the platform, but say you don't need to report charts or an article manager, you can deploy the platform and use solely independently developed microservices. The architecture is well-mapped to Amazon components as well. An application can be deployed on AWS using services like EC2, ALB, ECS, ECR, Route53, CloudWatch, Elasticache, ERD, and SES. Either a particular functional microservice or Core serves content adequate to the request. Core supports only a rest. Despite this, the functional microservices can handle requests for both a rest and a static content. The mentioned components support an authorization process — that is why they are able to throw a Forbidden exception. The Core microservice uses the descriptor to get information about the functional microservice and, based on this, injects all the delivered features to the platform. As we can see, Java developers do not have to create a whole microservices architecture from scratch. If it suits your needs, we've covered a ready-made solution and started the development of functional microservices. Of course, there may be situations where modifications of areas other than one's own microservices will be required, but still, the architecture exists.